Presents instructions for brewing and preparing the fermented tea known as kombucha, discussing its long history and health benefits, with recipes for smoothies, cocktails, sauces, salads, and puddings. Preface: Our kombucha journey -- Part 1. Getting started -- Fermentation: nature's nutritional gift -- Why kombucha tea? -- It all starts with the SCOBY -- The other ingredients: tea, sugar, water -- Brewing equipment and supplies -- Part 2. Just brew it! -- The batch brew method -- The continuous brew method -- In the bottle: conditioning, filtering, and flavoring your tea -- Advanced techniques for flavoring, brewing, and carbonation -- Troubleshooting -- Part 3. It's more than a health drink -- Flavor inspirations -- Smoothies, sodas, and spritzers -- Kick back with a "kocktail" -- Part 4. Cooking with kombucha -- Pantry staples -- Snacks, salads, sides, and sweets -- Consuming your cultures -- Beyond the beverage: other uses for kombucha -- Part 6. 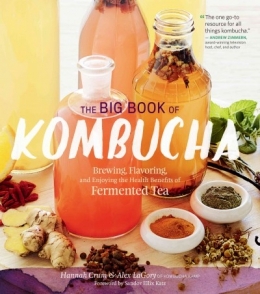 The story of kombucha -- The history and science of kombucha, condensed -- Craft-brewed kombucha: taking it out of the kitchen -- Appendix 1: What's in kombucha? -- Appendix 2: Highlights of kombucha benefits research -- Appendix 3: Bibliography. Includes bibliographical references (page 370) and index.